On my last trip to Costco I bought 2 packages of raspberries instead of one so i had extra berries to bake :). These were delicious! And super easy to make! Next time I’ll double the recipe! This would be good with strawberries too! 1. Preheat oven to 350ºF. Spray 8-inch square baking pan with baking spray. 2. In a small bowl, combine flour, baking powder and salt. Melt butter in a medium saucepan over low heat. Stir in brown sugar until moistened. Let cool slightly. Off heat, whisk in egg and vanilla. Stir in flour mixture until just combined. 3. Scrape batter into baking pan, smoothing top with a spatula. Scatter berries over batter. Bake until blondies are set in center, about 30 minutes. Cool completely in pan on wire rack. This entry was posted on July 10, 2012 by ilonaskitchen. 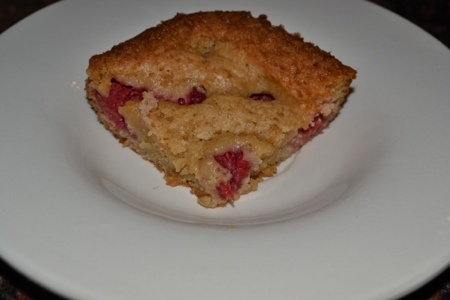 It was filed under baking, dessert and was tagged with baking, blondies, dessert, Raspberry.